Having grown up in a family of animal lovers, Dannielle always knew that finding a career working with animals was something she wanted to do. After 10 years working as a licensed Cosmetologist, she made the decision to begin her career as a Veterinary Technician and recently started taking courses at Argosy University. 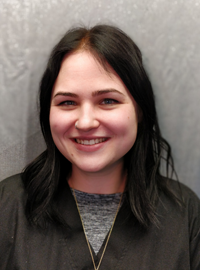 Dannielle began working for Golden Valley Animal Hospital in December of 2018, but prior to that worked for the Animal Humane Society with the Humane Investigators. Although the shelter work could be difficult at times, it also taught her that she really values the pets and the people who care for those animals. Working with the clients has been the most rewarding part of her career as a Cosmetologist and now as a Client Service Coordinator! Growing up in St. Michael-Albertville, Dannielle has never been without an animal in her life. Her parents share her love for animals as does her brother who is also a Veterinary Technician! She currently has two cats, Tinker and Marley and her sons, Asher and Arlo, who also appear to share her family’s love for animals! Their favorite toys to play with are stuffed animals and they love spending time with the cats. Although her life is very busy between school, work and motherhood, she still finds time to play games like Pokemon Go, Magic the Gathering or other board games, going to concerts and running. She also still really enjoys Cosmetology and continues her education in that field as well.